Precision cooking used to be relegated to the realm of restaurants. But a new generation of gadgets is making perfectly pink steaks and velvet-textured chicken achievable right in your own kitchen. Got some plastic bags? Paper clips? Some food, seasoning, and fat? Oh, and maybe a basic understanding of the shifting bacteria levels in proteins as they are affected by time and temperature? If so, then you might be ready to sous vide—a technique that might help you cook some of the most succulent, restaurant-quality food you’ve ever had in your life. Sous vide is French for “under vacuum,” a reference to how the food is cooked using…a vacuum. 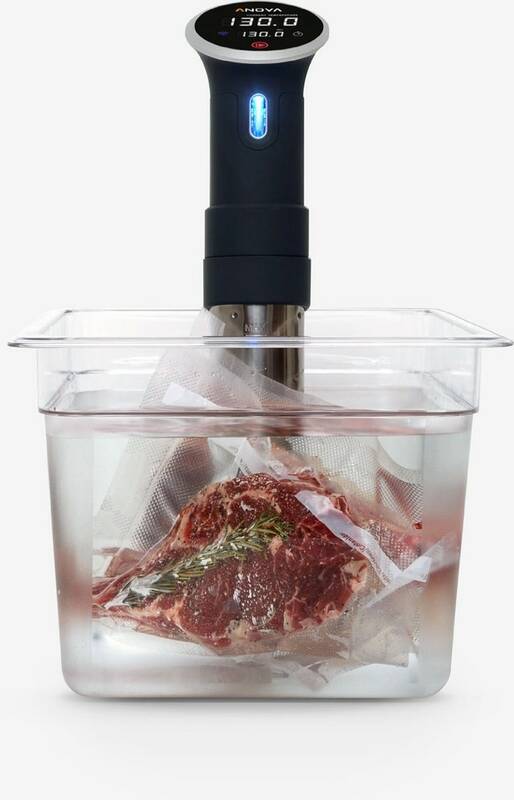 (You don’t really need a vacuum sealer to cook sous vide—slowly submerging a Ziploc bag in the water as the air is forced out works just fine.) In practice, “sous vide” means cooking your food in a tepid bath where the temperature never wavers for hours at a time. In decades past, sous vide required industrial laboratory-size equipment, making it primarily the privilege of restaurants and professional chefs. But today, it’s easier than ever to do it at home, even in my tiny NYC kitchen. To get started, Anova sent me their popular Anova Precision Cooker, a portable baton-like device that transforms any container into an accurate sous vide bath. You fill a pot with water, set the Precision Cooker to your desired temperature, and you’re basically ready to go. Underrated but also important, at least as far as kitchen aesthetics are concerned: The Anova also looks sorta rad, a glowing, futuristic food-making stick that softly hums away on your counter as it magically transforms ingredients. In many ways, sous vide is nothing like cooking—at least as most of us are used to cooking. And while sous vide is a simple concept, it definitely isn’t always easy. This had nothing to do with the equipment—the Anova worked like a dream, as it’s literally foolproof. (You can even control it via your iPhone when you are away.) But home sous vide cooking is still new enough that there aren’t seemingly limitless resources available online, unlike with regular recipes. When I first turned to Google for help, it wondered if I’d meant to ask about soup videos. Serious Eats, which has a partnership with Anova, has an extensive online sous vide database for the home cook, but I still often felt like a culinary explorer, sifting through various sites trying to divine the perfect sous vide formula for, say, a pork chop. Once you figure out what you want to cook, you have to decide the details: How many minutes? At what temperature? For what level of doneness? And at some point, you will probably consult a chart or two to make sure you aren’t zooming down the highway to the bacterial danger zone. For me, this was the most perilous part of the sous vide process. My family and I have a tacit working agreement: I cook a meal that is delicious and relatively healthy, and we all enjoy that meal together. Unspoken in that covenant is that the food I cook will not kill them. Thanks to years of experience, I know when a chicken is in an oven, once I get the breast to 165 degrees, even for a few seconds, I’m good to go. With sous vide, everything is different. If you set your machine at 145, for instance, by definition the chicken will never get even close to 165. But if you cook it for long enough at 145—say, one hour—not only will it be safe to eat, but it won’t dry out like it would at a higher temperature. Got it? To make things easier, the USDA produced this handy, nearly impenetrable document explaining all of this, and there are epic message-board threads and wonky websites dedicated to preparing delicious sous vide food without unknowingly seeding a bacteria farm. 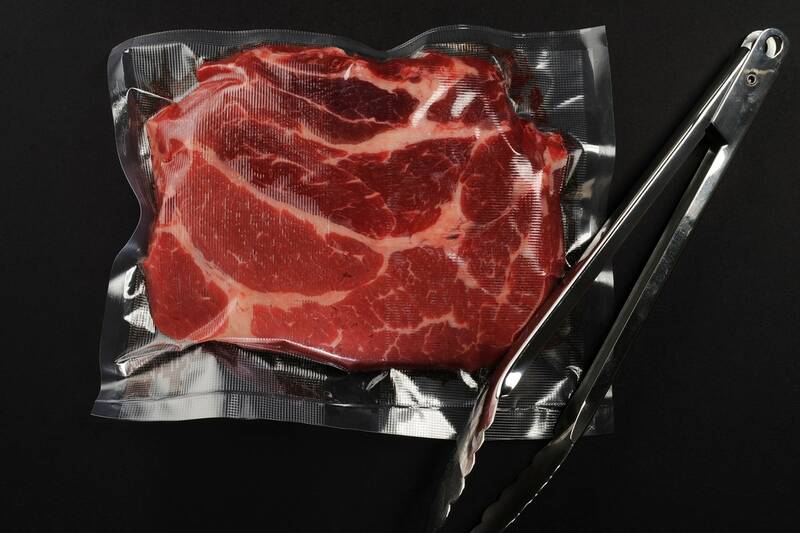 MENSTYLICA: Are You Ready to Sous Vide?